Apple River Community Church is a congregation of people, conservative and evangelical in doctrine, who love each other and are committed to serving the Lord and their community. The church has a rich heritage, having been founded in 1888 by Scandinavian immigrants. In 2001, we opened the doors of our new facility on the corner of US Highways 8 and 46. We changed our name from Apple River Evangelical Free Church to Apple River Community Church. We have a new building and a new vision for reaching out to those around us with the life-changing gospel of Jesus Christ through various outreach ministries. We believe that our Lord is at work here at ARCC and that He is building the body to enable us to accomplish the mission He has given us. Perhaps He is leading YOU to become part of what He is doing here. We are still a “work in progress”, but we are very happy with the progress that has been taking place at Apple River Community Church! The purpose of Apple River Community Church is to glorify God by helping people to find Jesus and grow to be like him. Apple River Community Church is affiliated with the Evangelical Free Church of America (Forest Lake District). 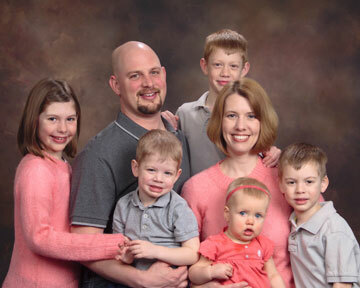 Pastor Justin and his wife Erin moved to Amery in the summer of 2013. They met while attending Northwestern University of St. Paul, where Justin graduated with degrees in Pastoral Studies and Bible. In 2014 he graduated from Bethel Seminary with a Master of Divinity emphasizing in ministry leadership. His passion is twofold: to preach the Word of God and to reach out to the community with the love of Jesus. Salvation is through Jesus alone and this message is what our world is in dire need of. Justin and Erin have five children that live at home with them. As a family, they are seeking to know Jesus and make him known. This is my prayer for you: that your love may abound more and more in knowledge and depth of insight, that you may be able to discern what is best and may be pure and blameless until the day of Christ, filled with the righteousness that comes through Jesus Christ- to the glory and praise of God. Pastor Bruce Tanner was called to Apple River Community Church in 2001. Born and raised in the Amery area, he graduated from St. Paul Bible College in 1970 and attended Bethel Seminary in St. Paul, Minnesota. 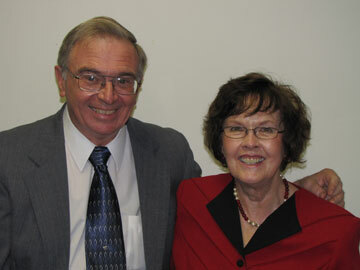 Pastor Bruce’s first pastoral ministry was to two small country churches in Michigan’s Upper Peninsula. In 1975 he married his wife, Ginger, a widow from Iron River Michigan with two sons. Pastor Bruce and Ginger have continued to serve churches in Wisconsin and Michigan all of their married lives. Ginger’s two sons, along with three grandchildren, still live in Michigan. In addition to his pastoral ministry, Pastor Bruce served as a hospice chaplain for about 10 years and has written Sunday School curriculum for Union Gospel Press.